BA (Hons) Marketing student at Nottingham Business School undertakes a 12 month work placement and flourishes with a first place prize. 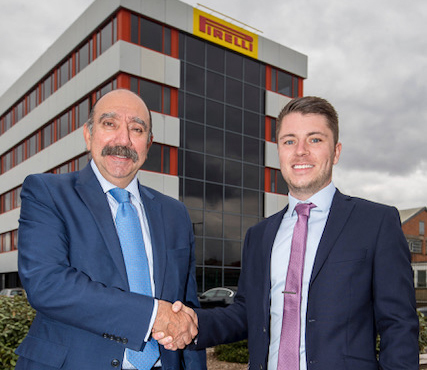 Securing his placement at Pirelli tyres Ltd, globally recognised for its cutting edge technology and high-end production excellence, George immersed himself into his placement scheme taking on responsibilities in a wide range of projects. Notably, George put his learning in to practice with a project centred around expanding brand awareness of Pirelli, particularly in the local community of Burton-on-Trent where the headquarters of Pirelli UK are located. The Pirelli Performance Centre Activation project comprised of three areas of development; Pirelli Performance Centre (PPC) open days, car/owners club performance evenings and an internal staff training programme. George worked on planning and implementing a range activities as part of this project including event management, customer liaison, product & training, social media management and PR reporting. George commented on his time at Pirelli - "I have thoroughly enjoyed my time at Pirelli and can't thank them enough for the opportunities they have given me in my time here. I stated from the beginning of my placement that I didn't want to coast though the year, I wanted to make a difference to the company I work for and expand my role beyond its core responsibilities. Thanks to the huge responsibility my team and management have given me I have successfully achieved this through achieving 1st Place in the 2018 Pirelli UK Student Awards. My project, Pirelli Performance Centre Activation was not only based around improving a business situation for Pirelli in the short term, but building a sustainable platform in which these events and practises can take place in the long run, after my time sadly comes to an end at Pirelli." As part of his placement, George was responsible for arranging a number open days giving the general public access to the state of the art tyre fitting facility owned by Pirelli for the very first time. The open days offered access to supercar displays, F1 simulators, 2018 F1 Tyre displays, as well as competitions and giveaways. Work placements are key to enhancing employability prospects in the global graduate market place. Increasingly, employers want to employ graduates who have real work experience and often use placements as an extended interview for graduate recruitment. Please visit our dedicated employability page to find out more about placements.